The 2015 Kerry Foods Charleville International Half-Marathon had a different feel to previous years, in that there were a number of the lead athletes who were attempting the distance for their first time and setting very good marks. 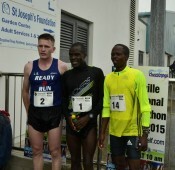 Young up and coming Irish athlete Liam Brady followed Ismail Ssenyange (Skechers Running Club) and Ian Kiprono (Iten, Kenya) home in what was a race of two halves. 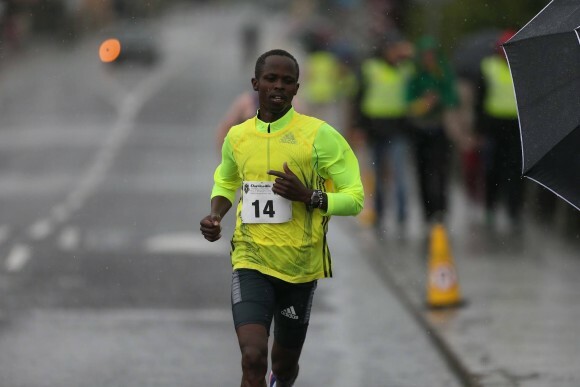 In the first half of the 21.1km race Kiprono stuck with the Ugandan born Ssenyange going through 10km in just over 31minutes but as they left the town of Kilmallock after half way, a gap opened between the two East Africans. At the finish Ismail, the man affectionately known as the Cheetah in Dubai where he works, had opened up a lead of about a minute crossing the line in a time of 1:06:04. Kiprono did well to stay ahead of a fast closing Brady of Tullamore Harriers with just 3 seconds separating the two athletes, the Kenyan running 67min and Brady 67:03. An interesting aspect to Kiprono’s participation is that he only entered the previous day and had also won the Sonia 5k in Cobh on the Saturday evening at a relatively relaxed pace. 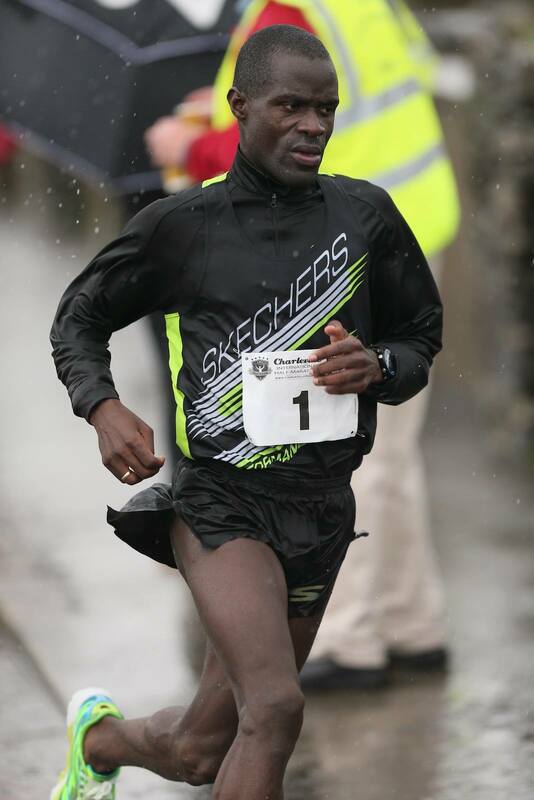 Kiprono is currently completing his level 2 athletics coaching course and travelling in Ireland with fellow coach Br. Colm O’Connell who is originally from the North Cork area. One of Br. Colms athletes, current Olympic and World Champion over 800m tweeted his congratulations to Kiprono for his good time in his first attempt at the distance. Br. Colm himself met a number of athletes and stood in for numerous photos for those who recognised the modest man in the crowd with his athlete. 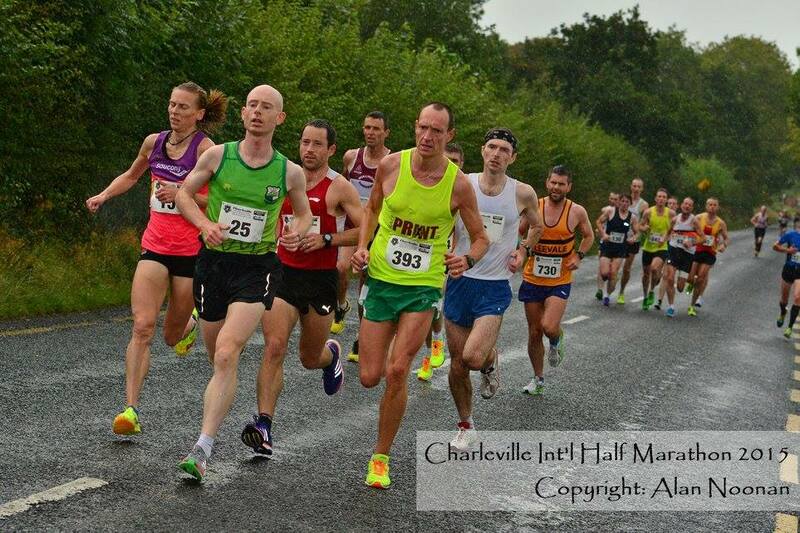 Canadian Ben Thistlewood (Leevale AC) won the Munster Half-Marathon Championship which was included as part of the race, when he finished 5th overall, just behind Ian Walsh of Raheny AC. 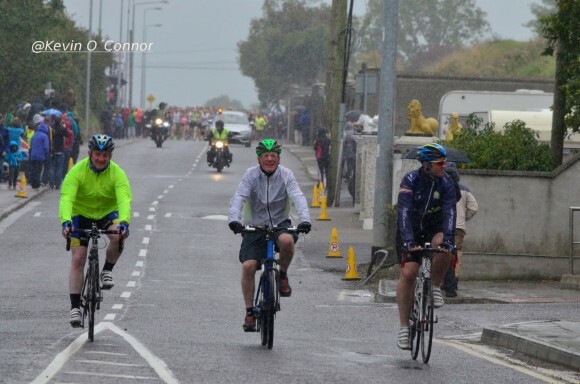 Both athletes were also completing the distance for the first time and were very satisfied with their strong times in wet and blustery conditions. Maria McCambridge was hoping to challenge her own course record from the previous year of 72:26. However, the conditions were not conducive to reaching close to the record as the wind affected her and most other athletes in the second half of the race. McCambridge however expressed confidence that she is in good shape as she approaches the Frankfurt Marathon next month to attempt to achieve the Olympic qualifying standard in that event. American runner Magin Day was second runner home in 80 minutes while Ann-Marie Holland of Youghal AC, a regular competitor in this event was 3rd in a solid 83 minutes. Over the space of 24 hours Sonia O’Sullivan went about participating in and help organise a 5k named after her in her home town of Cobh on Saturday evening. 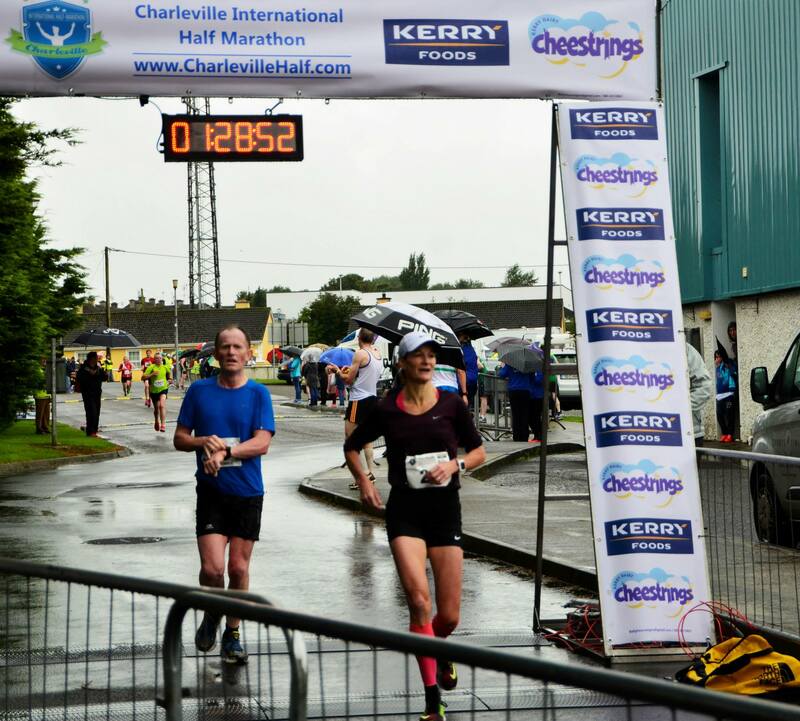 Then on Sunday morning, competed in the Charleville International Half-Marathon, winning her category, and soon after unveiled a bronze statue dedicated to her athletic achievements back in Cobh. She expressed great satisfaction at being able to have a good hit our over the 13.1mile distance and being able to receive cheers from her cousins in Kilmallock as she ran through the town. As usual she didn’t hesitate to sign autographs and pose for pictures with many groups of runners on the day. She made many a runners day and she incidentally also won her over 45 category in a time of 1:28:50. 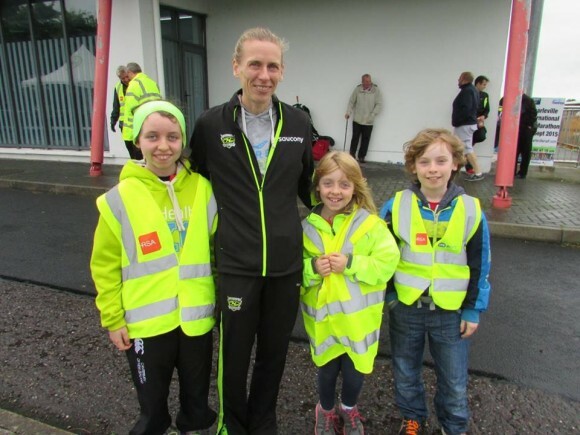 North Cork AC put together this highly successful event with the support of the community around them. It is obvious to all participants that it requires a large collective effort by numerous volunteers to make the event successful along with many others who provide support, from main sponsors Kerry Foods & Cheesestrings, to the Gardai, local residents out cheering and supporting to many others who played small yet significant roles in ensuring the event was such a success. It demonstrates the level of community spirit which exists which such a large task has to be executed in a short time. During the prize-giving, club chairperson Valerie O’Sullivan expressed the gratitude of the club to all those who gave their help both in the lead up and on the day. There was an increase in numbers of participants by over 20% with 816 finishers which rose from 670 in 2014. The increase in popularity is largely due to the flat and fast nature of the course allowing competitors to achieve a personal best. The event is the first in Ireland to receive European athletics 5 star rating for safety and organisation standards.